See why Study in the USA will also work for your program. Download our media kit here. Study in the USA®, established in 1977, was the first publication to promote U.S. programs to international students. With over 30 years of experience and expertise, Study in the USA® continues as the leader in the field. As technology has evolved, so has Study in the USA®. Launched in 1996, StudyUSA.com was the first of its kind. We have broadened our global outreach by strongly incorporating the latest technologies into our campaigns. As a result, we reach more students around the world and direct them to you. As magazine readership continues to grow,* Study in the USA® maintains its international outreach by distributing over 300,000 magazines to students all over the world. Print publications establish presence and credibility. In addition, magazines rank No. 1 at influencing consumers to start a search online. ** You can be confident that your print ads drive potential students to the web. Publications are distributed through EducationUSA advising centers, study abroad fairs, schools, universities, language schools, and placement agencies in major cities. Study in the USA® utilizes the latest technologies to grow our business and your enrollment. StudyUSA.com receives 600,000 unique visitors, generating over 21,000 inquiries every month. StudyUSA.com has more than 15,000 pages of translated content, which results in higher rankings on local sites. We employ multilingual ad campaigns, search engine optimization, and have built a network of strategic partnerships. 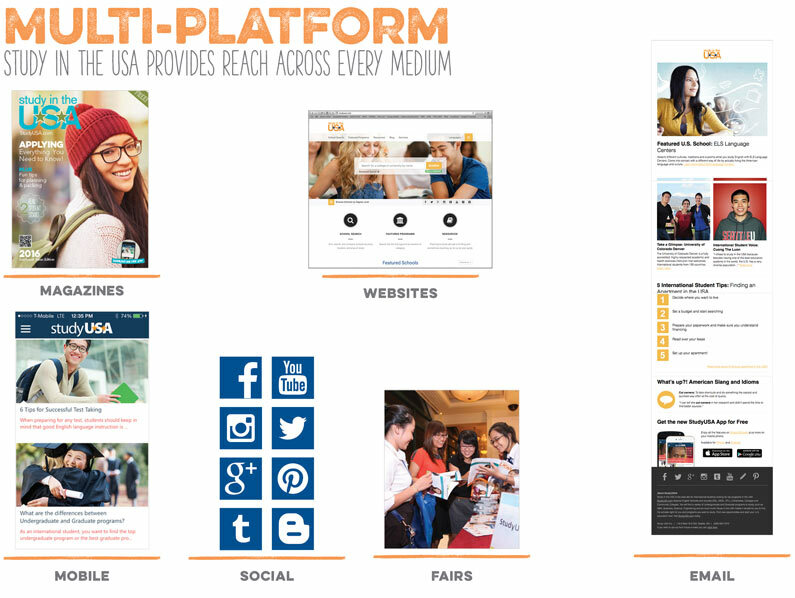 Our social media campaign includes Facebook, Twitter, Mixi, and the StudyLifeUSA blog. Study in the USA® will be where your students are. As a company, our sole mission is promoting U.S. programs. With our consistent connection to advisers and students, our knowledge is current and thorough. We understand your courses, degree programs, and campus life. Study in the USA®'s colorful and informative newsletters are read by over 1 million international students annually. Você gostaria de aprender inglês nos EUA? Você gostaria de aprender inglês nos EUA? Se o seu sonho for estudar no exterior e aprender a falar inglês em uma faculdade ou universidade americana, você está no lugar certo! "Study in the USA" é o melhor guia de educação para estudantes internacionais.Você pode contatar e solicitar informações de universidades dos EUA e de escolas de inglês grátis diretamente em StudyUSA.com. Encontre internatos nos EUA e também no Canadá. Use a ferramenta de busca de escolas nos EUA para encontrar cursos, faculdades e universidades nos EUA, incluindo cursos de inglês (ESL). Cursos de Engenharia, cursos de graduação, cursos de mestrado, cursos sequenciais (cursos superiores de 2 anos), cursos de Ciências, cursos de Arte e Design, Administração e Tecnologia, e Computação.